Help us Raise Money for 4 Paws for Ability, and lets get us some Paws 4 Gabriel! 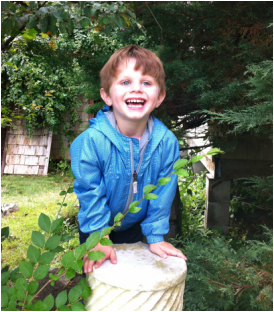 Gabriel Lacerda is a 5-year-old on the autism spectrum currently diagnosed with PDD-NOS. He was non verbal but now he has started to speak after extensive therapy that took 26+ hours a week. However, on his third birthday, he aged out of extensive therapy services and into ABA integrated classroom with peer partners as well as additional speech and OT. Gabriel is very active and needs to move all the time; he can’t slow himself down and is always running around. This excessive amount of energy exhausts him but his need to move overrides the need to rest and he keeps moving wearing his body out. He has GI issues starting with lactose intolerance, and the textures of most food put him off, making his selection of foods he can enjoy very minimal. He has started using full sentences recently and interacting and play outdoors. He has no fear. He leaps from high furniture and tries to leave the house to explore, even without an adult… and scariest of all, he has a dangerous attraction to water like many autistic children. Crowds overwhelm him and he does not like to be carried for too long and is very independent. This dog will allow him to walk safely with us with out wandering off but with independence. He loves to Smile and Laugh, and could really use the communities help to donate whatever amount they can to help him get closer to his goal of staying safe. Our goal was to raise $13,000 for the charity 4 Paws for Ability and we have met our Goal! We will now be able to attend class in April/May 2015 and receive our dog. Between now and then our family must raise as much money as possible to help us travel to Ohio and stay for 2 weeks while we attend the bonding classes. Please assist us by donating directly to our family using our paypal Donate button. These service dogs are trained to comfort during meltdowns, interrupt inappropriate repetitive or self-injurious behaviors, and provide comfort and companionship as well as tracking a child if they become lost. You can Help by Clicking on the link “How YOU can help” and making a donation to the Lacerda Family. Please remember any amount helps and no amount is too small. Please remember to share this site with others so we can reach our goal! Read the compelling New york Times Article "Wonder Dog" and see what these amazing animals can really do!